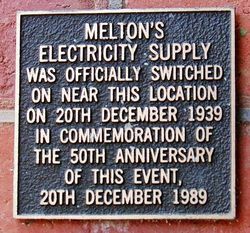 A plaque commemorates the 50th anniversary of the switching on of the Melton electricity supply in December 1939. 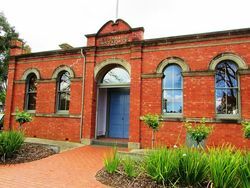 MELTON, Wednesday. 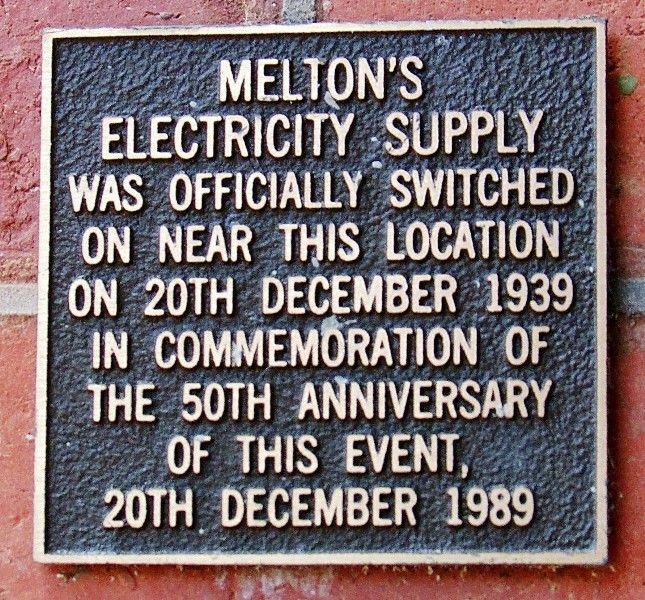 — Electric light for Melton was switched on this evening in the presence of a crowd of about 400 people. The ceremony was performed by Mrs. G. E. Robinson, wife of the former shire president, who cut a ribbon between two miniature towers with a golden scissors, which were later presented to her by an official of the State Electricity Commission. Other speakers who stressed Melton's progressiveness in introducing electric were Sir Wm. Angliss and Mr. G. Chandler, M's.L.C., Cr. O'Brien (shire president) and Mr. J. A. Richardson, of the State Electricity Commission. The latter stated that 10 farms in the vicinity were to be connected in the new year. Age (Melbourne), 21 December 1939.